Contributed by Field Staff Writer A. Fick. 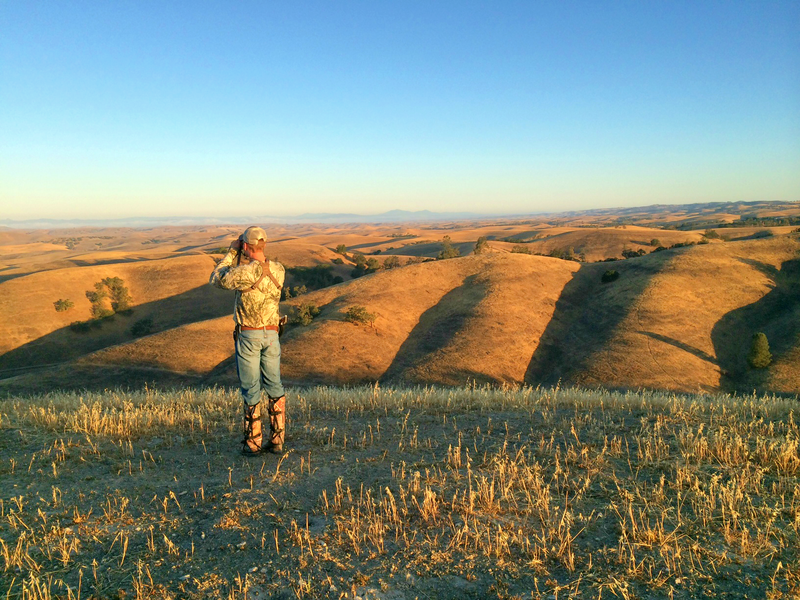 This past February I was invited back to the Walkin’ T Ranch outside of Paso Robles, CA to hunt wild pig. Jack, the guide, extended the open invitation to show his appreciation of my earlier mention of my experience on this blog, and also said that it was an early wedding present. I’m not sure how much my wife appreciated that, as I don’t think it was on our Pottery Barn registry, but I was very happy. We scheduled the hunt for the last weekend in June. Talking to Jack in preparation for the hunt, the pig activity was inconsistent, which dampened my spirits. He blamed the severe drought impacting California. Most notably, water sources dried up and since the ranch operates a “dry farm”, relying on Mother Nature to water the fields, the barley was thin at best. Barley, being a primary source of food for the pigs, is a necessity to attract game to the land. After driving up from Lakeside, CA and getting a few hours of sleep, I met Jack at the gate to the Walkin’ T Ranch well before sunrise. We spotted a large black boar crossing the road into the property we were about to hunt. Things were looking promising. We quickly gathered our gear and sprang into the Polaris. The air was a bit chilly, but when the Polaris made its way to the hunting site, the 20 mph wind made it downright cold. Foolishly, I had not brought an extra jacket. Jack told me that I had two options: 1) fast and painful; or 2) slow and painful. “Fast and painful, please,” I replied. After a long 10 minutes, we were at the top of high hill on the property. I recognized the site from my 2012 hunt. We began glassing the hillsides as the sun began to rise. We weren’t there long before a sounder of about 15 pigs crested the horizon and were headed our way. I readied the tri-pod, set my scope to 6x magnification, steadied my rifle and tried to calm my chattering teeth. Mind you, I had not shaken the frigid chill I got moments ago. I waited patiently as the pigs came closer into view. I had my eye on the grey one with brown spots because its coloration was brilliant. As they came to about 100 yards away, moving from my left to right, the pigs were keeping the sounder very tightly grouped. I could not get a clean shot on the grey one with brown spots, as my shot may have struck another pig. The large brown boar did allow for a clean shot, so I decided to change my plan. I placed the crosshairs on its shoulder and fired a shot from my 7mm Remington Magnum. The crack of the rifle was soon followed by the loud “thud” of the bullet hitting its mark, and all hell breaking loose as the pigs squealed and the entire sounder took off running. Jack yelled, “Hit him again!” I looked through the dust trying to find the pig I had hit. Surly it would be the one that was showing signs of being wounded. The problem was that no pig was clearly slower than the rest, behaving differently or limping – nothing. For fear of hitting the wrong pig, I held my shot. After the pigs had cleared out, Jack headed over the hill to see if the boar was lying nearby, as I checked the site of impact for signs of blood, bone or hide. We both came up empty-handed. To this day, I’m still in disbelief that my shot did not drop that animal. In fact, it didn’t even knock it over. At the time, I started to question if I had it the pig. Jack assured me I did, as he heard the bullet hit. There’s no mistaking that sound. He also mentioned that when they do take the large boars, it’s not uncommon to find a few bullets in it that are healed over. The boars have an “armor”, which is thick hide and muscle near their chests and shoulders. It protects them from the sharp tusks as they battle with other boars. It also frustrates hunters. As the sun rose higher, the pigs began to bed-down for the day. After moving to a few different areas of the property and glassing with no results, we decided to do the same and called it a day. 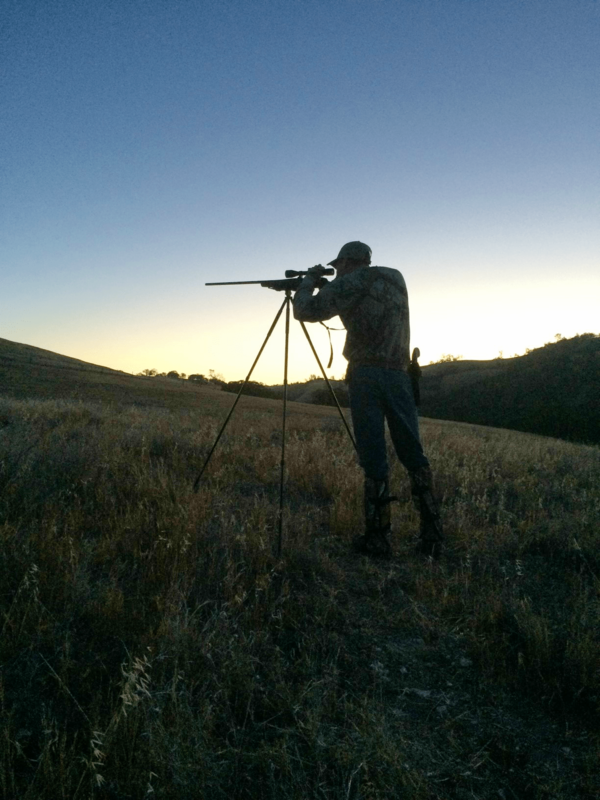 Pig hunting is most productive during the first two hours and the last two hours of daylight. We would meet back at the gate at 6:00 PM that evening. Later that day, we regrouped and headed back to the same spot as the morning. We glassed for about 30 minutes as the shadows grew long. This time, I spotted them first! The pigs were working their way out of an oak grove and up a hillside into a barley field about 500 yards away. We quietly approached using the oaks as cover. As we neared the bottom of the valley, we were looking slightly upwards at the pigs, which were now 220 yards away. There were about 8 pigs total, and the two at the front were nice sows. I placed one of those two in my sights and fired a shot. 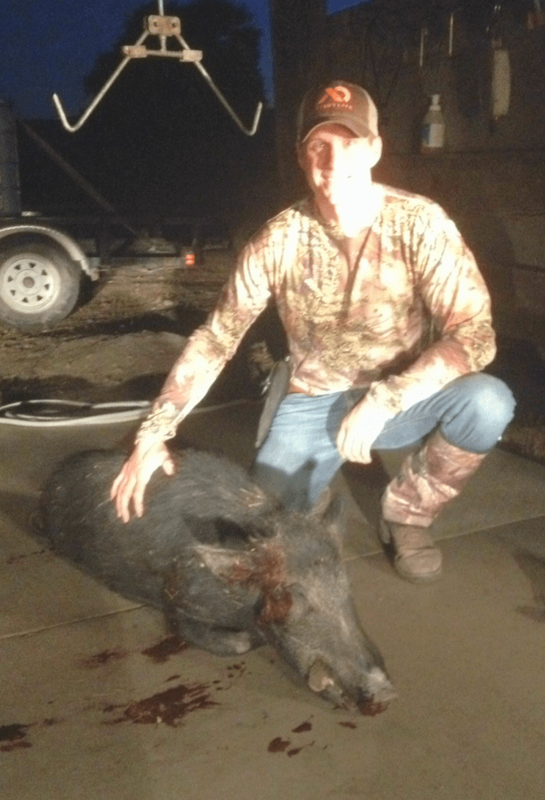 The 150 pound pig bucked and squealed. I knew I had hit it. It went down, but I could tell that it wasn’t dead. As Jack went back to get the truck, taking my rifle, I drew my .44 Magnum and headed up the hill to take a closer look at the pig. Sure enough, I had it hit through both front legs and the very bottom of its chest. My shot had been a bit low. It was immobilized, but needed to be finished off. I slowly walked to 15 feet from it, fired my pistol and shot it in the neck. It rolled over, still refusing to cooperate, so I put one more in its head. That did it. To give you an idea of how tough the hide is, it stopped the bullet from exiting the neck. 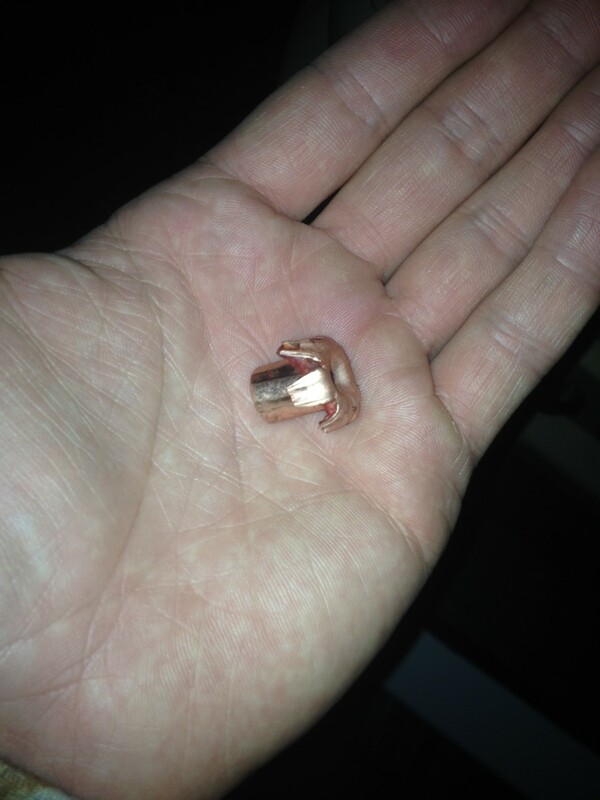 That’s a 220 grain solid copper bullet from a .44 Magnum at 15 feet. Incredible. That’s actually what caused it to roll over. I recovered it when we skinned the pig later that night. To say these animals are tough, tenacious or enduring is just the beginning. They are like group of tanks patrolling our lands. They eat what they want, go where they please, and reproduce like crazy. After the nuclear wars, the world will consist of cockroaches and wild pigs. Eradication programs funded by the State and Federal Governments are a ridiculous waste of resources. They are not going anywhere. 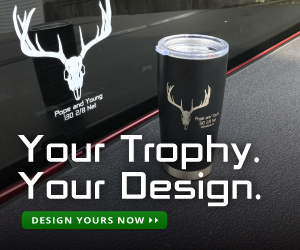 The only pragmatic approach to managing their population is by encouraging, promoting and assisting the efforts of responsible hunters. The advice I have for hunters is get out there, find them and enjoy the hunt. 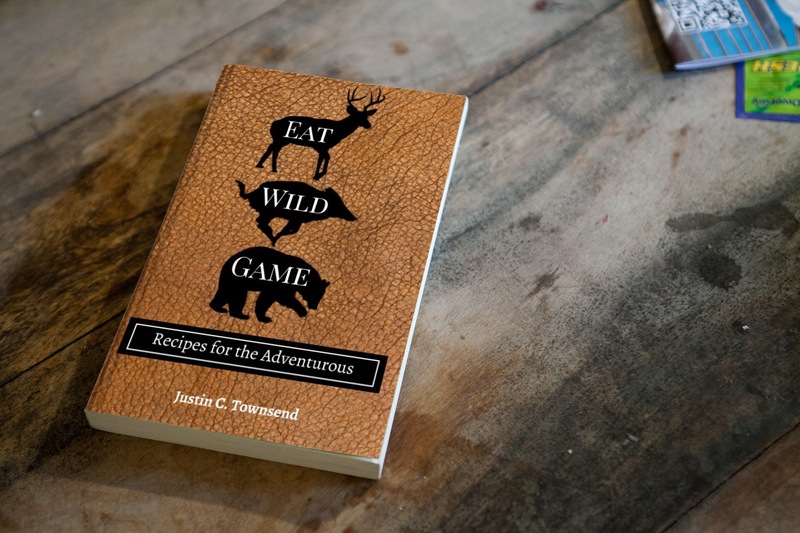 The hunts are rewarding and the quality of meat they provide is excellent. To conclude, I’d like to give a special thank you to the guys at the Walkin’ T Ranch. During the two times that I have hunted with them, I’ve spent a whopping five hours afield and have taken two pigs. You only get that kind of success when you’re really lucky or really skilled. These guys are extremely skilled. They know their land and they know pig hunting. Check out AJ’s first visit to the Walkin’ T Ranch here.